My homesteading journey started with trying to find a unique gift for my husband for Christmas several years ago. Like many wives after many years of marriage, finding a gift that is truly a surprise and something they would not buy for themselves was challenging. For years, he mentioned that he had always wanted to learn how to keep bees. It just happened that a beekeeping course popped up in my Facebook feed. It would be one Saturday a month for six months, so I signed him up and purchased a veil to wrap up for Christmas morning. After several months of attending Cyndi Ball’s beekeeping course, he convinced me to take one of her other classes offered on the farm. I took bread making, followed by honey harvesting, soap-making, and wild harvest jelly making. Cyndi finally convinced me to come to one of her “homesteaders’ meetings.” I was very reluctant. I did not farm. Yeah, we grew a small garden and I made jelly, sometimes but I was by no means a farmer. ...but I was by no means a farmer. I went to one meeting. I felt like I had stepped into a different universe. These normal looking ladies were using words I had never heard before: Kombucha, kefir, wild crafting, fiber arts. What in the world I had walked into? I sat in the back of that meeting and only said hello to Cyndi. I felt completely out of my element but also intrigued by so many smart, educated women with such varied interests. I continued coming to meeting after meeting. I sat in the back taking notes many months in row and going home to explain to my husband my new fascinations. We finally decided that we would try keeping chickens. Who doesn’t like free eggs, right? We ordered our chicks online and planned for their arrival by reading any book or blog I could lay my eyes on. I finally had an ‘atta girl to share at the next meeting. I was giddy to share with these amazing women my first little step into homesteading. Who doesn't want FREE eggs? Since then my homestead has changed a lot. In six years, we have added rabbits, meat chickens, and my personal goal, dairy goats. We did get bees and expanded our garden area. We bought two more acres and planted an orchard. We installed a hoop house and my husband quit his job to work our farm full time. We are learning everyday what being a modern-day homesteader means. To us, it’s growing and preserving our own food while teaching our four kids where their food comes from. It’s teaching our community about knowing their farmer and taking their health seriously. It’s showing our children the miracle of birth and the sadness of death. These are lessons not taught in our schools but in our own backyard. I may not be changing the whole world, but I am changing the world around me. Thank you, Brooke!!! Every year, the Statham Chapter, GA offers a Statham Homestead Trail and Brooke’s farm, Maple Park Homestead, is part of this tour. To follow her on-going journey, look her up on Facebook and on her website. I WAS 57 YEARS OLD. IT'S NEVER TOO LATE TO REWRITE YOUR STORY. Neither of us had ever owned as much as a chicken. My husband started a locksmith business, and I set about building a working farm. Our focus was on education, heritage breeds, and nutrient-dense food production. We made quite a bit of progress on these goals! Over the last 8 years we had a trial run with a dairy goat; raised heritage breed chickens and Khaki Campbell ducks for eggs; bred Gulf Coast Native sheep for breeding stock, fiber and meat; raised American Blue and Silver Fox rabbits for breeding stock, fur and meat; and raised American Guinea hogs for breeding stock and meat. It was quite a ride! I developed a reputation for quality breeding stock, integrity, and customer service that did not end at the sale. So many women and men mentored me over the years, and I passed on what I had learned to my buyers and interns. I developed a passion for the heritage breeds because of the need for conservation and the distinctive traits they had packaged in their genes. The breeds I chose were smaller, easier to manage, more docile, attractive to look at, and offered exceptional fiber and meat. Genetics held a fascination for me. I set about to interview “old timers” and pick their brains about their experiences with Guinea Hogs. When I added Guinea Hogs to my mix in 2013, I was disappointed at how little information I could find about them. So I set about to interview “old timers” and pick their brains. One thing led to another until I was the world’s expert historian on the breed, the person The Livestock Conservancy leaned on when a reporter called, and in the middle of a huge breeding project with the hogs to conserve some very rare bloodlines. By 2016, this had ramped up heavily. I had expanded my perennial and market gardens, too. I let the rabbits and sheep go to spend more time with hogs and gardens. I was set to double both of these endeavors in 2018. But in 2015 my granddaughter Charlotte was born, and two years later her brother Sammy arrived on the scene. I got a bit over extended with the farm and book research for a series of Guinea Hog books. I realized in early January that I needed to slow down and enjoy the grand babies before they reached school age or I might have a nervous break-down. I loved every minute of farmsteading. But as I turn 65 I realize that priorities are important and that it is time to change direction once more. We’ve found a lovely home in east Athens with a fantastic backyard garden. It is all woods and perennials with no grass. I’m looking forward to remodeling the house, spending more time with family, having a roomy and organized kitchen, mentoring others, and writing my book series. I will continue buying my eggs, meat and vegetables from local farmers. I will miss the meals I prepared with 1-5 ingredients I grew myself. I hope to attend LHG Gatherings and meet more of you face-to-face. I remain at my core a lifelong learner and a lifelong educator. Teaching is in my blood. Life is good! Thank you, Cathy, for sharing your story! The Livestock Conservancy also featured Cathy in their recent newsletter. So, what’s your HERstory? Are you interested in heritage breeds? What’s in store for your future? We love hearing from you! Let me tell you a little bit about our life on our farm, Thornberry Ridge, located in Draper, Va. (Wythe County side). We have 25 beautiful acres that look over the mountains and the New River. We raise and sell Large Black Hogs, Dexter cattle, and chickens--all on pasture. The hogs run on 10 acres of pastures and woods and are fed a non-GMO whole grain mix. They are raised as naturally as possible. They reach butcher weight at 10 months old, and the flavor is spectacular! We offer whole hogs for sale twice a year. We also raise grass fed Dexter beef that matures for 2 years on open pastures. We have a great processor that dry ages the beef for 30 days to enhance the incredible flavor of the Dexter beef. We offer whole and half beef sales throughout the year. We raise meat chickens on pasture for 8 weeks and then they are processed on the farm and packaged whole. We offer meat chickens for sale throughout our growing season of Spring through Fall. We also offer sausage making classes throughout the year, and have made breakfast sausages, Italian, Bratwursts, Keilbasas, hotdogs, and cheddar/jalapeno Bratwursts. It's a lot of fun! We also play around with dry curing and wet curing hams, bacon, salami, and pastrami. If you are interested in any of our products or classes, please call me! 276-617-2507 We have an open-door policy at our farm and encourage you to come see how we raise our food. Thank you, Aimee, for sharing your story of homesteading with us! As part of membership appreciation, Aimee's story is one which took many years and didn't happen overnight. If you have a dream like Aimee's, let us know. Tell us your story, where you are and where you are going! I started studying nutrition in my mid-twenties and realized how important it is to feed our bodies whole, unprocessed foods to stay healthy. I have fought allergies my whole life and recently had a bout with breast cancer so I am on a continuous mission to learn about natural healing. I try to avoid drugs unless truly necessary because of the side effects and even had my last two babies at home to avoid the pressures of hospital interventions. I look at food as medicine and am always interested in how it affects our bodies. This is where most of my homesteading activities stem from. I want to grow and prepare food that prevents and heals disease while tasting great, too. To do this, we have fruit trees and a garden, providing fresh produce. My husband hunts, providing clean meat that we process ourselves. We also have free-range chickens, providing natural eggs and meat. Our most recent addition is dairy goats. Throughout my health studies, I learned how nutritious and beneficial raw goat’s milk is compared to the processed cow’s milk you buy in the store. It’s much less allergenic and I wanted to give it a try. My daughter Lindsay, who loves horses and all animals, was also interested and bought our first goat, Rebecca, with her own money, even though she was only 13 at the time. We bred Rebecca and were lucky enough to be at the birth. Lindsay helped deliver the kid. We now have four goats and Lindsay has been faithful to milk every day for years now. We drink the milk, and also make kefir and cheese, but we still had extra milk. Lindsay was interested in making natural body care products, so we decided to make goat’s milk soap. It has since turned into a business we call “Freshen Soap”. Freshen, of course, means “to make fresh” as soap does, but it’s also what it’s called when a goat begins to make milk, she “freshens”. We keep the soaps natural and only use essential oils to scent them. Homesteading has been very helpful in homeschooling my four children. They’re able to see and experience biology concepts first hand and know where food comes from. They have learned responsibility by taking care of animals and have experienced birth, growth and death and learned many life principles first hand as well. The fact that we started the soap business has also been a great learning experience in commerce. Now that they are older and are having children of their own, I’m looking forward to spending time with my grandchildren on the farm. One of my favorite aspects of homesteading is being outside. After working inside at my regular job (we also have a family business selling horse trailers), it’s nice to come home and do the outdoor “chores” of taking care of the animals and checking on the garden. It does our bodies good and relieves stress to be out in the fresh air getting exercise from homesteading activities. The sunshine provides vitamin D that is so vital to our health. It’s also important to ground ourselves by touching the earth, which has been shown to reduce inflammation. I love getting in tune with the rhythms of nature and seeing the miracles of a seed sprouting, an egg hatching, the birth of an animal, bees swarming, and watching things grow. It reminds me of how big God is and that He’s in control which gives me a sense of peace. Last year, we had a very interesting garden. We had the local quail farm deliver loads of manure that we spread on a new garden area. We decided to plant it even though we weren’t sure if it was too “hot” from all the manure. We planted some neck pumpkins in the middle of the garden and they went crazy! I really think those vines can grow a foot a day! They took over the whole garden and shaded out the other squash and cucumbers, climbed over the tomatoes and corn and up the seven foot tall okra plants. My garden area ended up twice the size it originally was because the vines ran out all over the yard! I know I had close to 100 of these pumpkins to share! I took trunk loads of them to church and to our Ladies Homestead Gathering for a couple of months in a row and gave them away. My next project is to grow luffas to put in the soaps for exfoliation. I’m also learning more about herbs and how to grow and use them, both culinary and medicinal. This has prompted me to make some permanent garden beds to grow perennial herbs and vegetables like asparagus. I have always made homemade, whole grain bread, but I’d like to learn to make it from sourdough starter, with no store-bought yeast. I also want to continue learning to use fermentation as a preservation technique. Back in the fall, my friend Denese Norris, a former fellow homeschooling mom and midwife, contacted me about getting a Ladies Homestead Gathering together in our area. I had never heard of it but was excited about the concept. My daughters were also interested so we went. We had a surprisingly large group show up and are off to a good start! I helped with the meetings on soap making and fermentation. It’s great to have like-minded ladies to discuss all of these topics with. We can all learn from each other and share our knowledge and abilities. I’m excited to see what this year brings and to continue learning and fellowshipping with these fine ladies! Thank you, Dargan and Lindsay, for sharing your homesteading journey with Ladies Homestead Gathering! I grew up in the country... not like farm country... but in the wooded hills of northern New Jersey. There was no garden or chickens or tractors around... just a few bunnies as pets and I loathed my parents for making me grow up in such a place! I did spent quite a lot of time in New York City growing up. I thrived on being around people and having everything I needed within two square miles of my house. I can assure you, I was never going to change! Any time I would drive through rural areas, although I appreciated the beauty, I would say to myself… "Who the heck could ever live out here and WHY?" After marrying, sticker shock made it clear we needed to move outside city limits... Oh my word... you would have thought someone stuck me in the middle of a deserted island! Adjusting to suburban life wasn't kind to me but I settled in, had two little boys and adopted a little girl shortly thereafter. Insert mini-van, play groups and the dreaded home-owners association and I settled in to being a suburban mom! And as a side note, I had a dear neighbor friend who ate organic and when we'd go over for dinner she'd ask us if we wanted "cow's milk" or "goat's milk" and I just thought she was WEIRD! ...this stuff was just not on my radar! I grew up eating TV dinners! Then....about 8 years later something began to stir in me. It started with an atomic bomb hitting our family through unexpected and unfathomable trauma. Our world was shattered. I have no words to even describe it and what the next few years looked like. Anxiety, grief, and so many other emotions gripped my heart to the point I felt emotionally paralyzed. During these years our family was hit with more hardships... two job losses, the loss of my father-in-law, the loss of our five year-old puppy to cancer, a totaled car, our 13 year old son who nearly had a foot amputated, etc. Our world continued to crumble and seemed it was spinning out of control. As each of these hardships slammed in to our family it seemed layer by layer things we loved and clung too were being pulled from our clutches. The more we lost the more I started to yearn for and find inner peace in green pastures. The thing I wanted to escape from the most as a child was now the thing that brought me peace. We began reading...researching...dreaming of a different life. I WANTED CHICKENS and a goat and a garden and a creek and a fenced in back yard...I wanted country life! Now, if you talked to anyone that had known me for the past 45 years they would have told you that there is absolutely no way I would ever live in the country and no way would I ever own chickens... NO WAY!!! Now mind you I thought when we started homeschooling five years ago and then purchased a grain mill that I had hit the maximum on things I said "over my dead body" would I ever do. My son and I were diagnosed with gluten intolerance and everything about how we ate started to evolve! I started going research crazy and one by one things were removed from our diet (preservatives, coloring, flavorings, soy, gluten, dairy, etc.) and day by day the amount of time I spent in the kitchen got longer and longer.... first out of necessity... then out of desire. Little did I fully grasp the spark that had ignited in me! After a time of respite I was blessed to have in Italy, this spark nearly exploded. While there I met an amazing gal whom I quickly nicknamed "Farmer Girl". She looked like this pretty little Barbie Doll who I assumed was getting weekly manicures. It about blew my mind when I found out she owned farms in Texas, slaughtered her own animals, grew food for her family, homeschooled and could drive a massive tractor like a champ. And then she told me about Einkorn and about a cookbook called Nourishing Traditions....well.... the rest is history and we became soul sisters! So while my head was swimming with "what if's" and my heart was aching, I decided to chase after a dream. I love to write, I love photography, I love essential oils, I love to cook and DIY all sorts of things and I like to be authentic and try to be a blessing to others walking through the trials of life... so I jumped in head first and launched my blog, www.makeeverydaymatter.com. It was a place to set my heart free, empty my mind and nurture my love for the many passions I had in life. There was something stirring inside of us. I tried to talk myself out of it, moving that is,... we had no real "reason" to move…beautiful home, wonderful friends, great church... but my husband and I could not shake it off...we felt called to go. After 9 months of constant house hunting and 2 contracts that fell through, we finally found a 1.3 acre house to call home. It had a 2 bedroom cottage on the property which we spent one month renovating so we'd have a place to live during the house renovation. Our three teenagers would be sharing a bedroom and hubby and I would be sporting trundle beds in a tiny bedroom. Sounds fun, right? We quickly sold our old home and renovations began on our house. And then it all fell apart...literally... What was supposed to be a six week "cosmetic" renovation turned in to a total gut job which continued for ten months. In the middle of these set-backs we had something really wonderful happened… we bought an old barn/homestead that was being torn down! We literally stumbled upon a dream come true and were able to use so many found treasures to breathe new life in to OUR homestead! It's now been a year since we moved…and 2 months since we finally finished the main portion of the renovation. The chickens are now 11 months old and blessing us with an abundance of eggs. The dreams and plans are in full swing as we move on to the next phases of turning this home in to a full-blown homestead. A garden, barn, possible B & B, goats and a pig are on the wish list. But for now, our little buckets with half dead herbs, fresh green pasture growing in our new fenced in back yard and our adorable chicken coop filled with 8 ladies keep the spark alive to keep pushing on through the storm and pursuing our dream! Thank you, Mandy, for sharing your dream with us! We look forward to following your progress and will gain inspiration from your unfailing spirit. Every dream is a work in progress. What's your dream and what are you doing to pursue it? Join us in helping other women pursue their dreams! HERstory - What's Your Story? 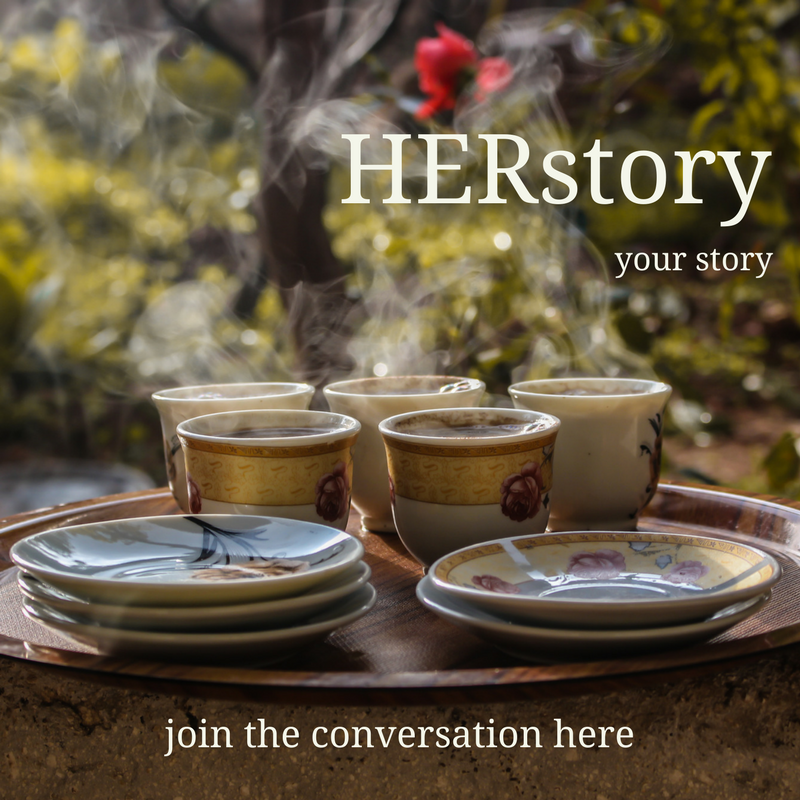 HerStory – What’s Your Story? Everyone has a story, a history or in the case of Ladies Homestead Gathering, a HERstory. Stories are used to teach and pass on traditions. Storytelling elicits many emotions which bind all of us together. We have already heard from a lot of our members telling their homesteading story, their struggles and their triumphs. This is why we have ‘Atta Girls at every gathering, to hear a success story or failure so we can encourage and learn together! On our blog, LHG Voices, you can read a few HERstory’s. For some, their homesteading journey was spurred from health issues with their child. For another, it came from a love of bugs. And yet, for some, they immigrated here and wanted to enjoy a way of life more similar to their childhood in a different part of the world. Whatever your story, it may touch someone else and help them in their journey. One of the foundations of Ladies Homestead Gathering is knowledge. From reading about someone else’s struggle, we learn through their experiences. You may have found a better, easier way of keeping water available for your chickens in summer. This may not be amazing to you but to someone else it could be a breakthrough. We also find commonalities in each other’s homesteading stories which fulfills one of LHG’s other foundations, community. For example, you may feel weird about your love of chickens, worms, fermented foods…fill in the blank, but then find several other people who share the same affinity. By telling your story, you are reaching towards other people and opening up a community for yourself and others. At LHG, we love to hear your homesteading story, your path and where it is leading you. It doesn’t have to be a novel (please, no novels). And it is not being graded or judged. We are all here to provide support! For those of you who think you can’t write or don’t have a story to tell, we created a list of questions for you to consider to help you put your story together. Of course, you can write it any way you want, in your own voice. Help us learn and grow together by telling your story. And, yes, it will be posted on LHG Voices! What’s your story? Do you ever wonder what this homesteading thing is all about? Well check this out… Ladies Homestead Gathering and Mother Earth News have teamed up to offer you a discount to learn as much as you can in one weekend at the Mother Earth News Fair. If you have never been, there is an abundance of knowledge and workshops on everything from organic gardening, animal husbandry to natural health. If you have been, then you know to get your tickets early because they have been known to sell out. Our founder of Ladies Homestead Gathering, Cyndi Ball, will be speaking on Simplifying Your Homestead Plan as well as Women on Homesteads: The Need for Community. Mother Earth News Fairs are happening all over the country. Hopefully, there is one near you, but, if not, make it a weekend getaway for your family and/or grab your Chapter members and help us support Cyndi. National Ladies Homestead Gathering will also have a booth so stop by and say “hi”. By the way, for each ticket sold through the links below, not only do you receive a discount, but, Ladies Homestead Gathering receives a small donation from Mother Earth News. It’s a WIN/WIN!!! Below are dedicated links for buying weekend passes for all Mother Earth News Fairs in 2018. Using these links gets you a $5 discount ($20 instead of $25)! Weekend wristbands include access to all exhibits and workshop presentations for both days. Weekend wristbands DO NOT include access to Hands-On Workshops. A separate ticket is required for Hands-On Workshops. Pre-order your wristband and SAVE! A weekend wristband at the gate is $30. Children 17 and under get in FREE and do not need a wristband. You can see a full schedule of topics, workshops and vendors by following the links. Ready to plan your best year yet? Plan on making Mother Earth News Fair part of your plan for growth, community and knowledge. Don’t forget to find our booth and say “hi”. We can’t wait to see you there. What topics interest you the most? Have you ever been? If so, what were your biggest take-away’s? Please post and share this information on your Facebook page! Anyone can use these links and it benefits LHG, too! Many times I have been asked what my homesteading story is by women in the Ladies Homestead Gathering (LHG) community. Each time, I wanted to duck and slink away because it seems like what I do does not fit the typical homesteading story. Of course with everyone’s story there is a history. Based on my Mother’s stories of my early childhood, I think I was destined to end up on the homestead journey. We were stationed in Puerto Rico at the time. My Mother describes walking out the back door to hang wash, seeing me at the age of three by a bush doing something. She walks over only to discover I am petting bees. Nope! I never got stung. "Mom came in to discover my lips were swollen like giant red grapefruits." Another time, I was playing with a large fuzzy white bug I called a “walking feather” as Mom puts me down for my nap; I continued to play with the “walking feather.” I wake from my nap and my Mom came in to discover my lips were swollen like giant red grapefruits. This led us to the emergency room where Mom discovered the “walking feather” was a toxic white fuzzy caterpillar. I had been rubbing its fuzzy hairs against my lips as I drifted off to sleep. On another trip to the doctor, he asks “Jill, what do you have in your hands?” As he reaches for my hands, I happily put my wonderful treasures in his hands. It was two dead rhinoceros beetles. The doctor jumped back a few feet and gave my Mother a look of sheer horror and he says “and you wonder why Jill is not feeling well?” You can imagine my poor Mother desperately trying to explain this and my other oddities. As the years when by, I had tarantulas, snakes, praying mantis, ant farms, sea monkeys, lady bugs, mud puppies and kittens all as pets. My fascination and love of bugs and critters continues to this day in my garden. My homesteading centers on bugs and critters. Currently, I live with my husband in subdivision which has a homeowner’s association. It is on a partially wooded, one acre lot, with fencing all-round the back yard where we can grow what we want. Our small garden is where we grow food but at the same time, it is a wild and wooly place for bugs and critters. I let nature have a fairly free-hand in the garden. When I moved to Flowery Branch I knew absolutely nothing about gardening. But I would plant something and be absolutely astonished and giggly every time something came up. I experience that same joy even today. My career is in graphic design. But I discovered quickly, as I started my homesteading journey, learning about gardening, companion planting, foraging, bee keeping, composting, and permaculture, vermiculture, I had little or nothing in common with my co-workers. I did not know another soul in the area that had any similar interests. But, I was happy experimenting in my garden. I call it experimenting because if I liked a plant I saw in a seed catalog, even if it was not suited for my zone, I planted it anyway. This complete naiveté has resulted in incredible success. In the middle of the summer, my garden looks like a wooly mess to the untrained eye but everywhere I walk in the garden there is something interesting to observe. Chipmunks run up and down the walkways, birds of every breed flit around, snakes slither by, tortoises lumber along, crickets sing in the daytime, tree frogs sing in the evenings, toads sit quietly waiting, praying mantis stand like watchful statues, lizards give me a knowing nod, robber flies, dragon flies, spiders of every color, size and shape, and every butterfly, bee variety, and wasp can be found flying around the garden at one point or another. So, where does Ladies Homestead Gathering fit into all this? One day someone over heard me talking about my gardening escapades and mentioned LHG. I was put in contact with Esther Artfeld who was just starting a new Chapter near me. Since, my current friends had convinced me I was an “odd bird”, I figured I would try it out but keep my eccentric gardening practices to myself. Not knowing what to expect, I was a little nervous but knew I might learn something and maybe make some friends. After about 15 minutes of hearing the other women describing their homesteading stories and interests, I knew I was in the right place. By the end of my first gathering, my universe had dramatically shifted. I was not alone in my ideas and thoughts; I was not an “odd bird” among these women. I had found a community that I could be part of and grow with on my homesteading journey. As I got to know the women in our chapter, I realized there was so much more to homesteading than just gardening. I became so profoundly moved by these women, their grit and determination, I felt a growing desire to learn and do more than simply attend gatherings. I wanted to play a more active part in my LHG chapter and give back to this community. As the ladies and I worked together developing topics for future Gatherings or setting up our booth at the farmer’s market, our friendships grew. Now, I have the most treasured friends of my life among these women. I attended a LHG fall retreat and was overwhelmed by the incredible women I met from other chapters. Instantly, my community and circle of friends grew. Now I have friends in Colorado, Virginia, South Carolina, and Alabama. We were sharing our knowledge and supporting each other on social media and reading through LHG blogs. "...everyone on the National LHG board was a volunteer...."
At our fall retreat I met Cyndi Ball, the founder, and the rest of the national board for the first time. As each board member spoke with me and discovered I was a graphic designer I saw an excited look in their eyes. They quickly asked me to be the graphic designer for LHG. I discovered everyone on the national board was a volunteer and their lives are even more hectic than mine and yet they were doing so much and homesteading on top of that. How could I say no to their request? Eventually, Esther had to move to Iowa and though part of my heart was breaking, the other part was filled with complete joy that her ultimate dream of a homestead was coming to fruition. I had always been honored to be Esther’s “wing-women” so when Esther asked me to take on the role of president in our Chapter; I agreed to step up. Though I was nervous to take on this role; my board has been so supportive and left me in complete awe and in gratitude for everything they do for our chapter. So, through my story you see how one person’s life has become so rich, full of joy and purpose through being part of LHG. What's your homestead story? How did you become interested in homesteading? Do you feel like you fit the mold of what people think of when you say "homesteader"? Ahhhh, ‘tis the season for lots of wishful anticipation, hoping that all our dreams come true in this magical month! My children pored over the catalogs, discussed certain toys with friends, weighed their options and finalized their Christmas list. Once that list was handed over, hopeful anticipation for Christmas morning grew steadily for the rest of the month. I loved reading over their lists and have saved several of them over the years. It was important to me that my husband and I knew the wishes of our children. It gave us the wonderful opportunity to make our child’s hopes and dreams come true. With the same mindset, I’ve asked the National Board of LHG, what are their hopes and wishes for tools to more effectively help them serve you. What are their dreams for our local boards to give them greater opportunities to connect more readily with their communities? After much discussion, research and weighing of options, the board members have turned in their lists and I wanted to share them with you. In this season of giving, we could use your help. We are in the midst of a very positive growth problem. The current funds aren’t matching the needs for this level of growth. We are celebrating this problem because it means we are making a difference. We are becoming the voice and avenue for change in the lives of lots of women! And with your help, we will attain the tools necessary to reach more women and share our mission with those who, just like you, are looking for a community of like-minded women. We are a young organization full of incredible women who definitely stand out in a crowd because of Ladies Homestead Gathering. I meet women all the time who would love to have this community in their town. And this to me is the reason to give … giving out of a thankful, grateful heart for all you’ve received from LHG so that others, like you, can have the life changing experience of a homesteading community. We are excited about the opportunities ahead of us, the amazing growth we are seeing, and the women we meet who are grateful for Ladies Homestead Gathering. Please take a moment to review our Dream List and see if there’s an item you could sponsor financially, either all at once or monthly, or even a portion. AND - we have $2000 in matching funds from anonymous donors who will match every dollar donated through the end of November!!! So your donation will go twice as far! If you have extra airline points, hotel points, or car rental points that you’d like to donate, we’d hugely appreciate that help! Or maybe your employer does a Volunteer Hours Match. We’ve had a few of our ladies use that and we are so grateful. Please email us if you can help us out in this way! So here’s the Dream List for Ladies Homestead Gathering…. $135 per year OR $11.25 per month- SoundCloud account for audio storage for podcasts, leadership calls, etc. $180 per year OR $15 per month - office supplies for National Board members (printer ink and paper). $600 upfront OR $50 per month for podcast equipment - microphones, software, etc. How do you make some of these wishes come true for LHG? Follow this link to the donation button on our website. And remember – this is a tax donation since we are a 501c3 … a write off!! And if you’d like to give a gift that gives back, sign up to be a member if you’re not one already! Your $35 membership fee gives YOU access to all our National Member Discounts and 20% of your $35 goes right back to your home Chapter. What is my wish this holiday season? To see the community of LHG grow and embrace the many women across this nation who long to be a part of a loving, caring, knowledgeable circle of friends. The harvest is in. The canning is done. The first frost either close by or behind us. It’s time to prepare the garden for spring or to plant a winter garden, depending on your zone. Take note of what was successful this year - and what wasn’t - and plan accordingly for your next growing season. Whether it’s rotating your garden to a new area, expanding or adding beds, or just enriching the soil, putting in some elbow grease now will make spring planting a breeze. Now is a perfect time to test your soil to see if it is too acidic or too alkaline. Soil that is too acidic is a perfect environment for weeds and disease. There are test kits available at most hardware stores, through your local extension agent or you can also test it yourself using vinegar and baking soda: https://preparednessmama.com/testing-your-soil-ph-without-a-kit/ . Your local extension office can direct you where to send your soil to be tested for more than acidity. These more comprehensive tests will tell you give you a more in-depth analysis of what your soil may be lacking. Hopefully, the weeds have not gone to seed yet, but, if so, carefully pull them up by the roots. Do not add these to your compost as they may find a happy place to grow again. Just add them to your burn pile or give them to your chickens as a treat! You may also consider a cover crop such as fetch or clover to keep weed pressure down and rebuild soil. First, throw away any diseased plants in the same manner as weeds. For healthy plants, cut the stems of the as close to the ground as possible. Leave the roots to decompose, adding nutrients back into the soil. Add the old plants to your compost. Add 1” to 2” of compost to your garden bed. This is also a good opportunity to add fresh manure (in moderation) since it will have all winter to decompose. If desired, you can add landscaping fabric. It will reduce weed growth and add heat to aid in decomposition of the mulch. Just remove it in the spring when you are ready to plant. Cover prepared beds with a thick layer of mulch of your choice. You can use hay, straw, leaves, dried grass clippings, or wood chips. Depending on what you choose to use will determine how thick to apply it. For finer mulches like hay, straw or grass clippings, you will need to apply a thicker layer. (Note: If using grass clippings, it’s very important that clippings are completely dry before application.) Denser mulches like wood chips or bark break down more slowly, so you won’t need as much. Don’t skimp on this step! The mulch layer is crucial to moisture retention as well as protecting your precious top soil from blowing or washing away. If you are so inclined, there are zones in which you can plant winter hardy vegetables like cabbage or turnips. Fall is also the perfect time to plant garlic for a summer harvest. There are two camps of thought on soil tilling; to till or not to till the soil. Which camp are you in? What has worked for you over the winter and what hasn’t? We are here to learn from one another so please share your thoughts with us. Plus, we are spread across the USA in multiple planting zones. Let us know how you prepare for winter in your home town. We love to hear from our members!